We only got a brief look at the world of Ahch-To in the closing moments of The Force Awakens, but it seems as if the planet will be playing a major role in Star Wars: The Last Jedi. It’s set to be the place where Rey begins her Jedi training under the tutelage of Luke Skywalker (who has gone from being stuck on an isolated desert planet to an isolated watery planet). 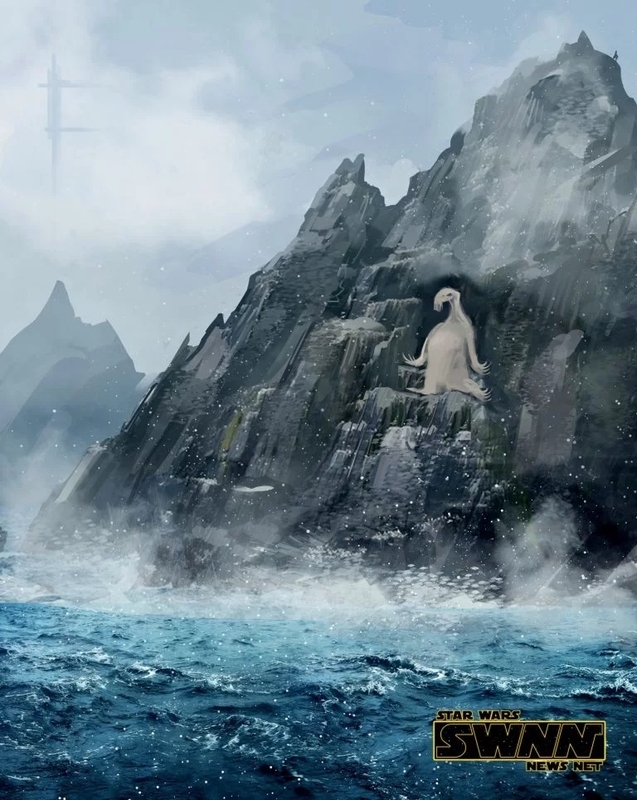 Apparently, we’re to see quite a lot of this location and all of its inhabitants, among whom are the avian Porgs, who act as the planet’s caretakers. Now, courtesy of the sketch down below by artist Eli Hyder (via Star Wars News Net), we have a look at one of the planet’s other inhabitants. It’s a weird looking thing, ghostly, ethereal and appearing somewhat incongruous with its surroundings. We first learned of this as yet unnamed creature in blurry long-distance photos obtained by SWNN, which show a nine-foot tall puppet operated by two people. What function this alien plays in the plot is currently unknown and in all honesty, I suspect it’s just background flavor to fill out Ahch-To’s ecosystem. Rumors are that, as part of her Jedi training, Rey will do battle with a sea monster but, creepy though it is, this thing doesn’t look like it’d put up too much of a fight. For now, it’s going in the ‘unknowns’ pile, but it’s always nice to see the creature gallery in Star Wars fill out, and it’s promising that they’re making the effort to populate Ahch-To with a unique ecosystem. After all, one of the best things about these films is spotting the weird aliens wandering through the background – just one element that makes the Star Wars universe feel that much more expansive. Star Wars: The Last Jedi is set to be released on December 15th.